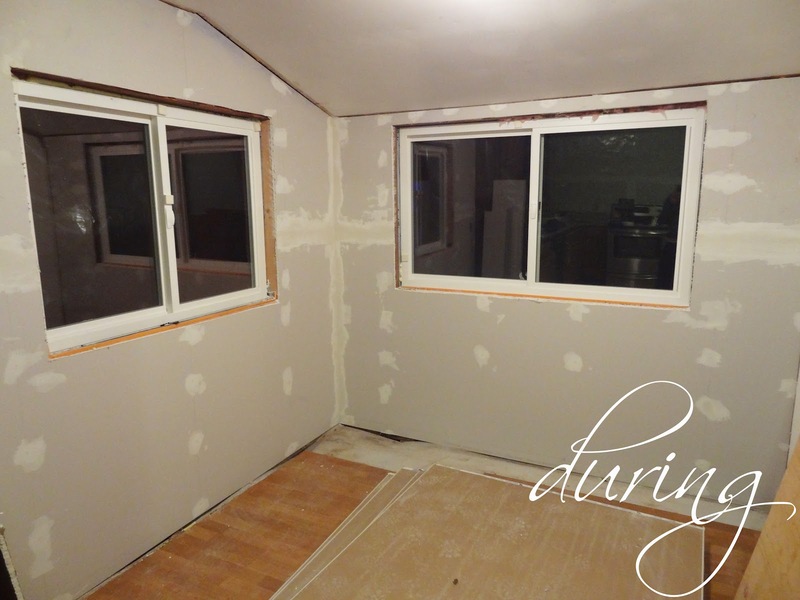 The drywall has been hung in both the nook and the kitchen. We used 1/2" thick in the places where the studs were exposed and used 3/8" to cover up the existing drywall that had wallpaper over the top of it. Because of the change in depth, we will have to trim out one door frame, but we were removing that door and planning on widening the opening anyways. After the drywall was hung, we spread three coats of mud and sanded after each coat dried for each of the seams and screw divots. Hot tip: Wet your sander a bit to keep the dust down. And check out The Family Handyman's tips for drywall sanding. 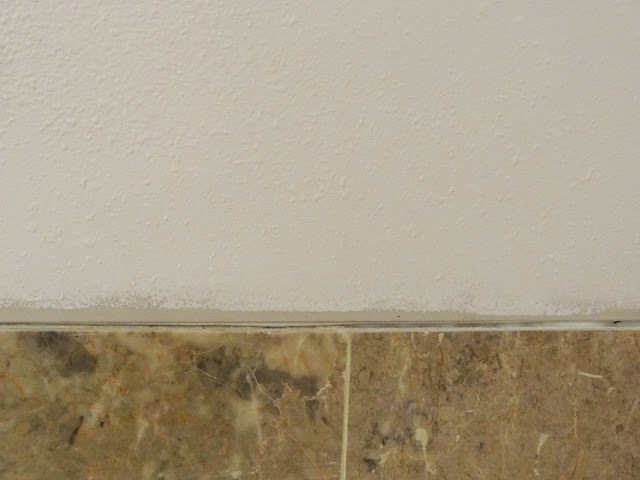 After the final coat of mud had dried and was sanded, we vacuumed up all the dust, wiped down the walls and sealed the crack between our counters and the drywall with a clear poly sealer. Then we primed the walls with drywall primer, sealed up the room with plastic & drop cloths and readied ourselves for spray texture. Sealed off and ready for texture - Dexter would be proud. We sprayed one light coat of orange peel texture with a Wagner Power Tex All in One Powered Texture Sprayer, which we purchased from Home Depot for $75. We considered using the Homax Spray Texture, but thought we'd get more than enough use out of the power sprayer with this house so the purchase was totally justified. Plus, each can of spray (for the pro size) was $16 and covered 125 sq ft. It just didn't seem very economical. Now for the orange peel texture you can purchase a box of Homax Wall Texture, which you just add water to, or you can dilute the joint compound you used to mud the seams. We chose the latter. I left the actual spraying to the hubs. He started in the corner that would be hidden behind the cabinets, to get used to the machine and hide any mistakes. Good thing! Because the first section's coat was a bit too heavy. He thinned out the compound a little more, took a step back and the rest of the texture came out perfect! With the texture dry, we sealed the wall with a coat of Zinsser Bullseye 1-2-3 Primer. This is a good quality all-surface primer that we'll use when we paint our cabinets, too. I also rolled out the first coat of ceiling paint. So, that's where we are now...waiting for the paint to dry, so to speak. I absolutely love marking off items on the list! With a day and a half left before our boy comes home we've still got a bunch to do. Better stop writing and get to work!